Many have found themselves on a small budget from holiday fiestas and gifts for the children. The house still needs work and an update to the deck has become a necessity. In this instance, re-decking can be utilized. So, what exactly does that mean and how does one go about it? Re-decking is a cost-effective solution. Contrary to a complete deck replacement, re-decking takes the existing frame and replaces old deck boards. Make sure that the frame is still holding up firmly before you decide to choose re-decking. New deck boards placed where the old ones were will be low maintenance but still appear upscale because they are brand new. Your deck will look re-done without the expensive price. Tear out the old railing and wood boards. Pull out any screws or bolts, remove the spindles, and then attack the wood boards. Take care to check if there are any loose nails and hammer them flat so as not to get injured. Do the stairs last. Mark the rail posts positions. Holding the posts in place with clamps, plumb each one and drill holes for the bolt heads. Mount the new deck boards. Start this process at the end of the deck farthest from the house. The key to laying the boards is to make sure they are parallel and have the same amount of space. Nail the landing frame together. Mark the footings, dig the holes for the stairs and make everything come together evenly. Construct the stairs and install the railing. Since low-maintenance decking is being installed, such as composite, a stringer may need to be added to the framing. Prior to installing the railing, saw the rails to fit within each set of posts. 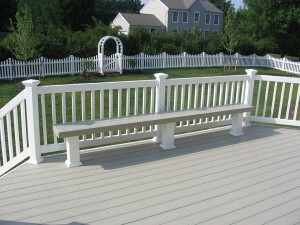 The best way to go about re-decking is to call Mid-Atlantic Deck and Fence for the project. There are many details left out in these basic steps and using a professional to get the job done is a safer solution. We strongly suggest you stop by our showroom to take a firsthand look at some of the various low maintenance decking products we carry. If you have any questions about Re-Decking, please contact Mid Atlantic Deck & Fence (MAD Fence) today by clicking here or calling 1-800-833-9310. We proudly serve Anne Arundel, Baltimore, Howard, Montgomery and surrounding counties.